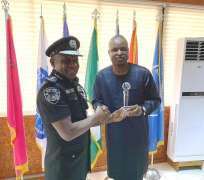 The Deputy Commissioner of Police, commanding the IGP's Intelligence Response Team, DCP Abba Kyari has again been honoured by 'Security Watch Africa'. He was honoured with "Golden Star Award for Oustanding Gallantry in Africa. The Kanuri-born super cop have received numerous accolades and awards in recorgnition of his dedication to service and hardline posture against men and women of the underworld. The Prestigeous award was presented to the Nigeria Police crime burster by IGP Ibrahim Kpotun Idris , NPM, mni, PSC. The IGP expressed his appreciation to DCP Abba Kyari for his dedication to his professional duties. In his response, he thanked Security Watch Africa for the award. He also thanked IGP for all his support and fatherly enablement in discharge of his duties. DCP Abba Kyari used the window to appreciate all members of the IGP Intelligence Response squad for their unflinching support in the fight against violent crimes in Nigeria. The renowned detective can be better described in the words of 'Crime Bursters International' "Abba Kyari has become an epistle to be read by many and a case to be studied by youngsters. He is an examplary leader to be emulated and a worthy subordinate to be honoured for loyalty. His life is an open course and his heroism is an accolade to Nigerians in general."